Elizabeth reads widely across many genres and has a large following of readers at her blog, ElizabethColtonWalls.com. You can also learn a lot about Nashville real estate there! I am always happy when one of her posts arrives in my in-box. Elizabeth and I share a deep-seated, abiding love for the 14 books in Frank Baum’s Oz series; The Patchwork Girl is her favorite. Today, she gives us a round-the-world tour of murder mysteries. But she hasn’t answered one question: how in the world will I ever choose? From Elizabeth: Don’t you wish you were traveling someplace exotic this summer? You considered a “big” family trip, but the expense, the hassle, and the squabbling siblings wore you out before you could say TSA. And admit it – relaxing on the porch with a juicy murder mystery sounds much less stressful. Now you can do both! Below are book suggestions that satisfy both your wanderlust and your taste for crime solving – consider each a Blue Guide & crime novel in one! Vish Puri, known to close friends and family as Chubby, is a portly, Punjabi private investigator in Delhi. In his trademark Sandown caps and carefully waxed mustache, he is assisted in his investigations by his loyal associates, Facecream, Tubelight, Flush, and his driver, Handbrake. Occasionally, much to his annoyance, “Mummy-ji” (his mother) interferes as well. Vish has investigated all manner of mischief in his long and celebrated career. Vish’s investigative techniques combine the ancient wisdom of his hero Chanakya and the modern technology of wiretapping. Vish is also inordinately fond of disguises which he acquires from Chatterjee & Sons, a venerable firm who outfitted the troops of the British East India Company. The Vish Puri series mimics the traditional British murder mystery so closely as almost to be a spoof. Vish bears a remarkable resemblance to Hercule Poirot and on occasion employs the Belgian’s habit of bringing all the suspects together for the Big Reveal. 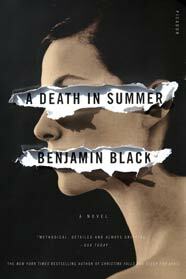 Man Booker Prize-winning novelist John Banville writes an atmospheric, literary mystery series under the pen name Benjamin Black. I’m not a huge fan of Banville’s work, but the Black novels are exceptionally fine. Set in 1950’s Dublin, a small, depressed town, not the Celtic Tiger of later decades, the novels feature a brooding pathologist named Quirke and his colleague Detective Inspector Hackett. The investigations often put the two men at odds with the government, big business, and the Catholic church which are almost always one and the same. A series in the style of Ruth Rendell and other classic mystery writers. After the phenomenal success of The Girl with the Dragon Tattoo, Nordic crime novels are the hottest thing in publishing. There are a half a dozen excellent authors, but one of my favorites is Swedish author Helene Tursten who writes the Detective Inspector Huss series. The novels feature Irene Huss and her law enforcement colleagues in Goteborg, Sweden. The bleak setting may be unfamiliar, but the details of a police investigation are spot on and universal–takeout pizza, lying witnesses, and endless paperwork. Although a policy procedural, Tursten offers fully developed characters with plenty of back-story. Irene like working moms everywhere struggles to balance her (grisly) job and family life. Since her husband is a professional chef, she rarely worries about what’s for dinner, but with two teenage daughters there are other worries, as well as the more mundane matter of whose turn it is to walk Sammie, the dog. Not as grim as the work of some of her Swedish colleagues, but dark enough. With ten books to date, the historical mystery series by Jacqueline Winspear continues to engage. Set in England between the wars, nurse turned private investigator Maisie Dobbs takes on the cases Scotland Yard and her pal Detective Inspector Caldwell won’t touch. Maisie has made a success of her PI business, but in spite of her changed circumstances, she still thinks like the housemaid she once was, which is both a potential strength and a weakness. Her insecurities and struggles with life/work balance (an unknown concept in Maisie’s day!) give this series a surprisingly modern feel despite the historical setting. Three Pines is a quaint, off the grid Canadian village which has a higher murder rate than Chicago! As such, Chief Inspector Armand Gamache and his team of Montreal-based homicide investigators travel there on a regular basis. Although murder drives the plot of Penny’s novels, the characters of Three Pines are the real story. In the tiny hamlet a number of remarkably diverse residents reside including an internationally renowned poet and her pet duck, a retired psychologist turned bookstore owner, and a pair of gay innkeepers. Over time, Gamache becomes friendly with the residents which leads to some awkwardness, as inevitably a few are prime suspects in the investigations. A subplot concerning conspiracy at the highest levels of the Surete du Quebec is mildly distracting, but overall this is a compelling series. These two novels are not mysteries per se, but someone is murdered in chapter one of both novels! After I read this novel a few years ago, I talked it up for weeks, but I’m not sure I had any takers! Brilliant. Read the complete review on my blog. This is not Vish Puri’s India! Adiga’s Man Booker-Prize winning novel depicts an India that is dirty, dangerous, and overwhelmingly corrupt. Read the complete review on my blog. Thanks for your post. I found these three series through Kindle $1.99 deals. I love the Maisie Dobbs series; I’ve read eight of them so far. (Unfortunately, they weren’t all riced at $1.99!) I just found Inspector Irene Huss and am in the first book, but I plan to read more of them, too. I actually found this post because I was curious to see if someone had written about Maisie Dobbs and Irene Huss together.